I’ve huge fan of Cajun food. Seriously, don’t ask me why – I grew up the Midwest and don’t think I tasted anything from the cuisine until I was in my twenties. It was a revelation to me, my first tastes of blackened this and blackened that. Jambalaya, Red Beans and Rice, Po’ Boys. Nothing shy about it, nothing really fancy, either. Nothing expensive. Often the ingredients were dirt cheap, but the flavors! Flavors that you couldn’t forget, seared into memory. Not necessarily hot (It’s a myth that Cajun food it hot – that’s what hot sauce is for) but spicy, earthy, rich and true. I’ve dabbled a bit with Cajun cooking, traveled a bit over the years, and tasted Cajun in New Orleans and in the homes of Southern friends, but everything I thought I knew about Cajun was turned on its head last week. I ate at a restaurant that served Shrimp and Grits with a “Cajun Gastrique,” Grille 26 in Sioux Falls. “What the “h” “e” double l hockey sticks is a Cajun Gastrique” you might ask. I know that’s what I thought!! The waitress was stumped and came back with “a reduction of vinegar and Cajun spices.” Ok, I thought to myself, “La di da. I’m going to be sorry I ordered Cajun in South Dakota” and did it anyway. Wow. Wow, wow, wow. My Shrimp and Grits were perhaps not true Cajun food, but Cajun food elevated by a genius of a chef. I want to marry him, I don’t care how young or old, I don’t care what he looks like or how much money he has. My folks said, “What if it’s not a him?” I thought for a minute, and then said, “I don’t care, I’m just in it for the food! And I’ll never tell he/she I know how to cook! I’ll just let him/her do all the cooking for me.” This last all said in a Southern accent. And of course, I came home and dabbled with the Gastrique. And here’s my version, a little sweet, a little sour and reduced until it’s so full of flavor it’s practically a black, tarry mass. As far as flavor, think of hot pepper jelly meets Tabasco, meets the best balsamic syrup you could ever imagine. Of course, none of those ingredients are in here, but that description will take your imagination towards the taste. I used this Cajun Gastrique for my Shrimp and Grits and saved the excess in a little jar (it will keep a long time, well preserved by the sugar and vinegar) to drizzle on anything else my heart desires. It could be used almost any place you’d use a little hot sauce. Add sugar and water in a small, heavy-bottomed saucepan. Turn heat to medium-high. Stir now and then until sugar melts. 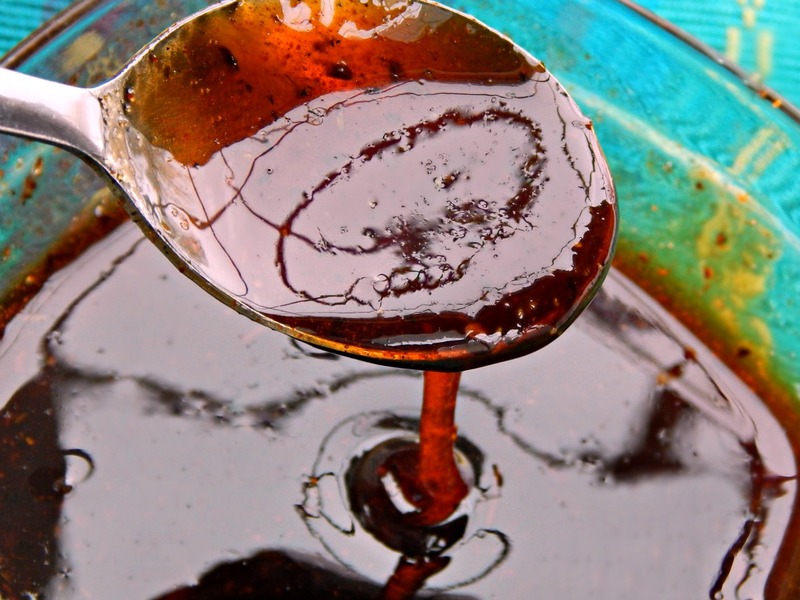 As soon as the sugar is dissolved, stop stirring and let the mixture cook until it begins to turn amber in color. Add the vinegar and spices and cook, stirring frequently, until the mixture reaches a slightly syrupy thickness. It will thicken more upon cooling. Watch for the bubbles to become a bit smaller and test by placing a bit on a plate and allowing it to cool. Any crystals forming on the side of a pan should be washed down with a pastry brush and a little water. This gastrique does not necessarily taste fantastic by itself; just like a hot sauce, it is very intense in flavor. Feel free to allow to cool a bit and taste, adding more sugar, vinegar or spices as desired. Be very careful of the hot sugar. Serve by warming very slightly. You may need to warm slightly to pour into a jar or container for saving. I will also be bringing these over to Angie’s Link Party, Fiesta Friday # 106, Hosted this week, by Stefi from Ginger & Bread and Andrea from Cooking with a Wallflower! It should be another great party!! This entry was posted in Click here for Fabulous Food Posts and tagged Cajun & Creole, Easy Recipe, Frugal Hausfrau, gastrique, Spice & Herb Blends. Bookmark the permalink. I can’t wait to try this! My wife is Cajun and she has this really weird, really old Cajun cookbook. It has the strangest things in it but this week we’re gonna test Burnt Sugar Pork Jambalaya from that book for a possible video. I think this sauce would smash with it, in a good way. Thanks for the inspiration! I LOVE old cookbooks! The ones with the strange recipes are my fave! I can just read them like some people read books. Then my memory is so bad, I can read them again and again, lol! So this sauce is really surprising and incredible and so different! I’d love to hear what you think! You had me in stitches reading you this morning Mollie. You should forward this post to the chef who introduced you to the gastrique! He/she would like love it!!! Maybe a transplant from New Orleans! I made shrimp and grits over the holidays and they sure didn’t look as great as these! I use instant grits loaded with cheese too and they always turn out. I will try your recipe to kick the shrimp part up a notch. Was in NO in the fall. Oh the food! such a fun city to visit. Love the new design of your site by the way! You make me want to visit New Orleans, and pronto! Nom nom! I love Cajun shrimp! And grits! I love Cajun food too and the gastrique sounds like my kind of food! Love your photo! Thanks, I’ve only had a sweet gastrique before with a dessert so this was a bit of a new idea for me. I like to use a bit of vinegar to perk up flavors in soups and gravies so this is just that same idea only MORE! I think I’m going to be experimenting more with gastriques. lol, well, I know you love a lot of the same flavors that are in that spice mix – it’s just a bit of a nudge from a harissa..
I’ve made an amazing sour cherry gastrique which I served with roast duck but a cajun version sounds pretty interesting especially if it got that kind of reaction out of you. Food is fascinating … I can’t relate to people who hate to cook. I’ve had the Zatarain’s Dirty Rice and it’s really pretty good! 🙂 I have only had one other gastrique and it was a dessert one – but I love sweet/sour/heat so I guess it stands that I’d like this! We had some fun on a steamboat we took across the mighty Mississippi – I told the people near us that the last time we crossed the Mississippi, we just stepped across. I had a few weird looks till I explained we were from Minnesota and at the headwaters there are couple of stepping stones and the river is about six feet wide. I had a similar visit to New Orleans MANY years ago … a trip on a steamboat to see the battlefields, beignets and chicory coffee at the Cafe du Monde. They had a jazz and heritage festival at the racetrack and I ate alligator.